Properties for sale in Normandy, France - AHIN-SP-001098 • St Pois area • Country Estate in Normandy with 33 acres - ideal as boutique Hotel or Retreat with a smart, purpose built B&B with 7 en-suite letting rooms and a pretty 2 bedroomed Gate House. AHIN-SP-001098 • St Pois area • Country Estate in Normandy with 33 acres - ideal as boutique Hotel or Retreat with a smart, purpose built B&B with 7 en-suite letting rooms and a pretty 2 bedroomed Gate House. This immaculate country estate would please even the most discerning purchaser or guest. There are 2 acres of parkland and landscaped gardens with an in-ground heated swimming pool and a professional tennis court. The remaining land is well maintained and regularly grazed, carefully laid out to give access to natural streams in all paddocks one of which has a stable block. Viewing is highly recommended to appreciate the charm and income potential of this property. For those wishing to generate additional income there is a nearby complex of 3 gîtes available. The house is situated near a village with a shop and 2 minutes drive from the small town of Saint Pois with every day amenities and school. 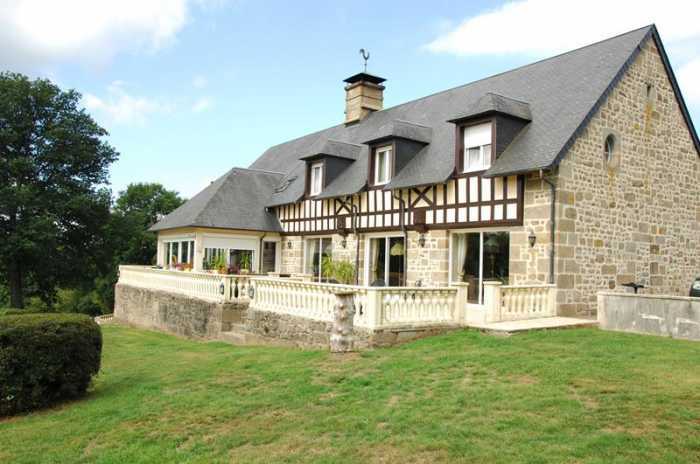 It is 15 minutes drive to the market town of Sourdeval and 15 minutes drive to Vire. The Lac de la Dathée, ideal for walking, fishing and boating, and an 18 hole golf course are within 10 minutes drive as is the Saint Sever forest. It is situated in the southwest of Normandy, near the borders of Manche and Calvados. The beaches on the west coast are an hour’s drive away and it is approximately 80 minutes drive from the port of Caen and an hour and forty minutes from Cherbourg. Lounge/Dining Room 100m² Tiled floor. Arched door and window to rear elevation. 3 sliding patio doors (one opening) to terrace. Stairs to first floor. Granite fireplace with ceramic wood-burner and display recess. Telephone socket. 2 built-in cupboards. Study 3.28 x 2.85m Window to front and south elevations. Tiled floor. Door to utility rom. Door to stairs to basement. Study 3.28 x 2.85m Window to front and south elevations. Tiled floor. Door to utility room. Door to stairs to basement. Inner Hall Tiled floor. Door to garage. Door to lounge. Security entry telephone system. Built-in cupboard. Cloakroom Tiled floor. Vanity unit with mirror and light over. Tiled floor and walls. WC. Kitchen/Breakfast Room 10.50 x 4.80m Tiled floor. Range of matching base and wall units including display unit. Granite worktops and tiled splash-backs. Stainless steel sink with mixer tap. Granite fireplace with large Aga. Space for American style fridge/freezer. Built-in microwave. Triple aspect with glazed door to terrace. Utility Room 5.52 x 5.00m (max) Window to west elevation. Tiled floor. Range of matching base units. Space for free standing American style fridge/freezer. Electrics. Space for range style cooker with extractor over. Sinks with mixer tap. Worktops and tiled splash-backs. Space for under counter fridge. Full height matching cupboards. Door to study, kitchen and garage. Door to stairs to first floor. Hall 4.83 x 3.18m Tiled floor. Door to lower terrace and garden. Granite stairs to ground floor. Boiler Room/Laundry Room 4.70 x 2.79m Boiler. Tiled floor. Space and plumbing for washing machine. Electrics. Window. Beautiful Stone Vaulted Ceiling Wine Cellar 7.05 x 4.68m Ventilation. Stone walls. Gravel and concrete floor. Old cider press. Snug/Hobby Room 3.52 (max) x 3.39m Glazed door and fixed patio doors to lower terrace. Radiator. Laminate flooring. Telephone socket. Landing Glazed double doors to rear elevation and “Juliette” balcony. Laminate flooring. Hatch to loft. Door to second landing. Bedroom 1 4.65 x 4.25m Circular window and window to front elevation. Radiator. Laminate flooring. Bedroom 2 4.63 x 4.24m Window to front elevation. Radiator. Laminate flooring. Cloakroom Tiled floor and walls. Velux window to rear elevation. Suspended WC. En-Suite Bathroom 4.42 x 3.10m Velux window to front elevation. Fully tiled. Vanity unit with mirror and light over. 2 person bath. Heated towel rail. Suspended WC. Walk-in shower. Inset spotlights. Family Bathroom 2 Velux windows to rear elevation. Sloping ceiling. Heated towel rail. Tiled floor. Partly tiled walls. Bath. Vanity unit with mirror and light over. Second Landing Door to loft over garage. Stairs to second floor. Laminate flooring. 3 built-in cupboards. 2 radiators. Stairs to utility room. Shower Room 2.92 x 1.86m Fully tiled. Velux window. Suspended WC. Twin vanity unit with mirror and light over. Large walk-in shower. Heated towel rail. Inset spotlights. En-Suite Shower Room 2.99 x 2.04m Tiled floor and partly tiled walls. Window. Twin vanity unit. WC. Shower. Heated towel rail. Bedroom 5 4.58 x 1.60m Velux window to rear elevation. Sloping ceiling. Inset spot lights. Radiator. Entrance Hall/Reception Area 3.56 x 3.35m Partly glazed door and side panel to front elevation. Tiled floor. Stairs to first floor. Radiator. Alarm/fire alarm system controls. Boiler Room 3.65 x 2.07m Electrics. Boiler. Hot water cylinder. Tiled floor. En-Suite Wet Room 3.32 x 2.00m Tiled floor. WC. Shower with fold-down seat and safety rail. Heated towel rail. Vanity unit with mirror and light over. Dining Room 5.57 x 5.41m 2 radiators. Tiled floor. Granite fireplace with wood-burner. Window and glazed door to front elevation. Kitchen/Breakfast Room 5.90 x 2.78m Stairs to first floor. Tiled floor. Glazed door and window to front and window to rear elevations. Radiator. Range of matching base and wall units. Tiled worktops and splash-backs. Space for free standing cooker with extractor over. Sinks with mixer tap. Space for American style fridge/freezer. Extractor. En-Suite Bathroom 3.32 x 2.03m Bath with tiled surround, mixer tap/shower fitment and screen. Vanity unit with mirror and light over. Tiled floor. WC. Heated towel rail. Landing - (via stairs from entrance hall) 2 windows to rear elevation. Wood flooring. 2 hatches to loft. Radiator. Walk-in linen store. En-Suite Shower Room 3.68 x 2.02m Obscure glazed window to front elevation. Tiled floor. Vanity unit with mirror and light over. Shower. WC. Heated towel rail. En-Suite Shower Room 3.36 x 1.48m Obscure glazed window to front elevation. Heated towel rail. Shower. WC. Vanity unit with mirror and light over. Tiled floor. En-Suite Shower Room 2.73 x 2.37m Obscure glazed window to rear elevation. Tiled floor. Heated towel rail. Shower. Vanity unit with mirror and light over. WC. Landing - (via stairs from kitchen) Wood flooring. Hatch to loft. En-Suite Shower Room 2.85 x 1.66m Tiled floor. WC. Corner shower. Vanity unit with mirror and light over. Heated towel rail. Obscure glazed window to north elevation. “L” shaped Kitchen/Breakfast Room 4.57 x 2.32m and 2.30 x 2.06m Partly glazed door and small window to front and small window to rear elevations. Tiled floor. Stairs to first floor. Cupboard housing electrics. Space for upright fridge/freezer. Cupboard housing hot water cylinder. Matching base and wall units. Space for free standing cooker with extractor over. Space and plumbing for washing machine and slimline dishwasher. Sink with mixer tap. Central heating thermostat. Exposed beam. Radiator. Shower Room 2.10 x 1.99m Tiled floor. Vanity unit with mirror and light over. Inset spotlights. Suspended WC. Heated towel rail. Corner shower. Lounge/Dining Room 6.58 x 5.88m Upright radiator. Tiled floor. 2 windows to south and sliding patio doors and feature full height windows to west elevations. Radiator. Exposed beam. Master Bedroom 5.58 x 4.68m Exposed stone wall and beams. Feature granite fireplace. Display niche. Wood flooring. Claw foot bath. Vanity unit. Window and partly glazed door to external granite staircase. Upright radiator. Stairs to second floor. Bedroom 2 4.40 x 3.00m 2 windows and round window to front elevation. Wood flooring. Sloping ceiling. Radiator. Wooden gates lead to a brick driveway with lighting. Large terrace with outside lighting and tap to the front of the main house. There is an in-ground swimming pool with pool house situated in the main grounds between the Gate House and B&B accommodation and a professional Tennis Court. Garage/Workshop 10.82 x 5.87m Stairs to loft over garage and workshop. Laundry Room 4.04 x 2.92m Tiled floor. Ceramic sink. Space and plumbing for washing machine and space for tumble dryer. Hot water cylinder. Partly glazed door to rear elevation. Park like gardens with mature trees and shrubs. Brick paviour courtyard with feature pond/turning circle. The remaining land is arranged as paddocks. Pond. Enclosed stable block area with 3 stables and open fronted barn. The B&B accommodation has a terraced seating area to the front and rear and an enclosed garden laid to lawn with flower and shrub borders to the rear. Wood garden shed. Outside lighting and taps. Parking for several cars. The Gate House has a terrace and garden. Mains water, telephone and electricity available. Drainage is to three all water septic tanks. Double glazed windows throughout. Oil fired central heating in the main house with under floor heating on the ground floor. Gas fired central heating in the B&B and electric heating in the Gatehouse. Broadband internet connection. Please note : Under French legislation effective from 1st April 2013 this property is unrated in it's Energetic Performance Test because the Vendors do not have the last 3 years heating bills. Please note : All room sizes are approximate. Every effort has ben made to ensure that the details and photographs of this property are accurate and in no way misleading. However this information does not form part of a contract and no warranties are given or implied.